Vasil Kiryienka – a world bronze medalist of the discipline in the past – won the individual time trial between Treviso and Valdobbiadene and nabbed his third stage victory at the race, but the news of the day was Alberto Contador putting on a huge performance and getting the pink jersey back, after he lost it in the 13th stage. Thanks to his ride – one of the best of his career in an ITT – the 32-year-old has a commanding advantage in the overall classification over Fabio Aru, of almost two and a half minutes. Surprisingly, Costa Rica’s Andrey Amador is third, with Rigoberto Uran and Jurgen Van Den Broeck more than four minutes behind, while Richie Porte is out of contention, now that he is almost nine minutes adrift. On Sunday, the peloton will tackle a high mountain stage with a summit finish – Marostica-Madonna di Campiglio (165 kilometers). The route initially passes through Valdastico, clears the La Fricca KOM climb, and then runs down the long descent leading to Trento, where it takes in the first kilometres of the Monte Bondone climb. From here, the route then heads towards Sarche, Terme di Comano and Tione di Trento. With 40 kilometers remaining to the finish, the bunch will be confronted with the very challenging Passo Daone (8,4 kilometers) climb that features an average gradient above 9% and peaks reaching as high as 14% in the central sector. This is followed by a difficult descent, on a narrow mountain road, with some hairpin bends, and generally steep slopes up to Spiazzo. The route starts to rise again, first with a deceptive false-flat drag up to Pinzolo, then with an average 6% up to the last three kilometers, after crossing the urban area of Madonna di Campiglio. 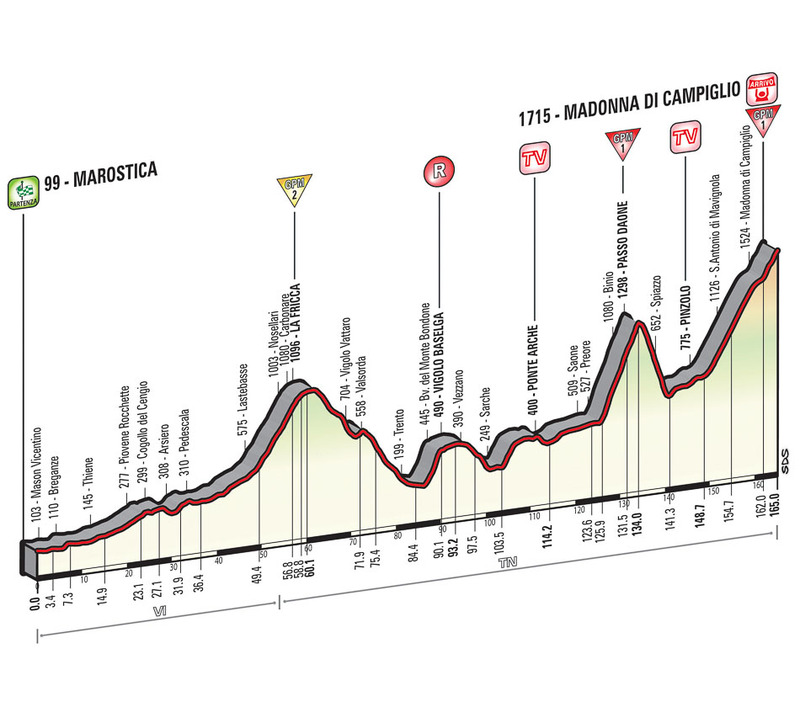 Starting in Carisolo, the final climb has a length of 15,5 kilometers, with steady gradients of around 6,5% up to Madonna di Campiglio. The route runs across the urban area of the town (with a short setts-paved stretch); the highest slopes (12%) are found outside the town. The last two kilometers run at a 7% gradient on a well-paved asphalt road (with a 5,5-m width at the finish). Is the most important altitude finish of the race so far, but despite of that, many are saying the GC men will not fight for the victory, opting to let the breakaway have a shot at glory. If this happens, then Darwin Atapuma, Stefano Pirazzi, Diego Rosa, Beñat Intxausti, Ilnur Zakarin, Franco Pellizotti and Carlos Betancur are very likely to feature, the Colombian rider of AG2R having an extra motivation, as he is in the hunt for the mountains classification, where he is currently sitting in third. After putting such a large gap between him and the other contenders, Alberto Contador can play it safe and try a defensive approach, but if the chance arises, be sure that the Spaniard will go for a stage victory, which would be his first in the Giro d’Italia. On the other hand, Fabio Aru also wants a win and to reduce the advantage of Contador, so he’ll be very interested in sending Astana at the front to trim the peloton and launch him on the Madonna di Campiglio. Once the individual time trial – which he finished in 55th place – was done and dusted, Richie Porte began weighting on the fact if he should continue the race or stop and go home to prepare for the Tour de France, where he’ll act as Chris Froome’s key lieutenant. Finally, Sky’s captain has decided to stay in the Corsa Rosa and now can try to get a stage win that could nurse his hurt ego after what was a horrible second week. 16 years ago, when the Giro d’Italia visited Madonna di Campiglio for the first time, it was the Marco Pantani Show, as the Mercatone Uno rider – winner of the Giro and Tour de France in 1998 – took his fourth stage at that year’s edition, after attacking 5,5 kilometers from the end. After putting more than a minut between him and the likes of Massimo Codol, Laurent Jalabert or Gilberto Simoni, Pantani – leader of the overall standings back then – said at the press conference that he “sensed a state of grace” during the stage. Unfortunately for him, it was all over a day later, once he was expelled of the race due to the high hematocrit level, of 51,9%.